1893 - Louis Rembs comes to Marshfield and establishes his own furniture and undertaking business at 212 North Central Avenue; in the building that later housed Pritzl Hardware, and more recently Ace Tattoo. At that time the undertakers made caskets, so furniture and funeral homes were a natural combination. 1895- Jacob Sturm joins Louis Rembs in partnership and together they purchase the furniture and undertaking business from Weber & Derby. 1915 - Louis Rembs & Jacob Sturm erect a new building next to First National Bank. 1918 - Jacob Sturm leaves the partnership. 1920 - Louis Rembs brought his only son John "Shy" and his wife Doris, who had been managing a funeral home in California, back to Wisconsin and renamed it Rembs & Son Furniture and Undertaking. They had previously worked for Louis before moving to California. In 1889, Mr. Dolge founded the first permanent school of embalming to popularize the method and his products, and this was known as the United States College of Embalming. Dr. Auguste Renouard was the demonstrator, and later purchased the school which was then run as the Renouard Training School for Embalmers until 1954, when its was absorbed by the American Academy, McAllister Institute. 1923 - Louis Rembs retires, Rembs & Son Furniture & Undertaking consolidate with Baer & Lange Furniture and Undertaking. 1926 - In addition to operating both Rembs & Son and Baer & Lange Furniture and Undertaking; the three owners build and operate a new funeral home on 108 West 4th Street, Marshfield, WI. It was at this location that embalming facilities were added so the embalming could be done at the business location instead of at the individual's home. 1937 - John Rembs leaves the partnership with Melvin Baer and Oscar Lange in December. He opens his new funeral home at 202 W. 4th Street, formerly owned by Frank Upham (present site of Associated Bank). 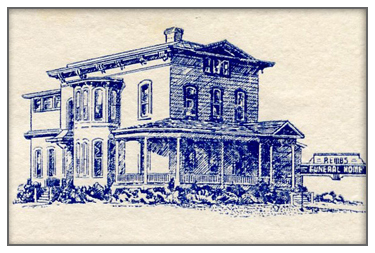 1938 - Jerome Sauter Purchases the Stratford, WI funeral home from the Harder Family. It operated as Sauter Funeral Home. 1939 - In August the Rembs furniture business was discontinued to focus soley on the undertaking business and fully comit themselves to their commuinty. Mid 1950's- Doris' sister Lucine, and her husband, Joe Felhofer join the business after Louis' death. 1961 - The current facility at 300 South Oak Avenue, Marshfield, was built under the direction of John Rembs and Joe Felhofer. This building was constructed at an estimated cost of $100,000. 1962 - John Rembs died in March of 1962. 1974 - DuWayne Kundinger, an employee since the 1950's purchases the business from Joseph and Lucine Felhofer. It operated under the name Rembs / Kundinger Funeral Home. 1977 - Rembs/Kundinger Funeral Home acquired the Sauter Funeral Home from Jerome Sauter in Stratford WI. It operated under the name Sauter / Kundinger Funeral Home. 1985 - Rembs/Kundinger purchased the existing Martens Funeral Home and Hardware Store in Junction City and built a new (current) facility in Junction City, WI. It operated under the name Martens / Kundinger Funeral Home. 1998 - John Person, an employee since 1978 and Greg Jackan, an employee since 1983, form a partnership and purchase the business from DuWayne Kundinger. 2005 - A crematory is installed at Rembs Funeral Home. 2009 - Names change to Rembs Funeral Home, Sauter / Rembs Funeral Home and Martens / Rembs Funeral Home. 2010 - The Marshfield location goes through an extensive remodel. 2011 - Sauter / Rembs purchases a new building (901 South Weber) in Stratford and remodeled it to replace the old Sauter/Rembs Funeral Home (251 N. 3rd). The old building was donated to the village. 2012 - Rembs Funeral Home acquired the Buchanan Funeral Home in Pittsville, WI on June 29 and renames it "Buchanan/Rembs Funeral Home". 2016 - Greg & Tami Jackan assume sole ownership after they bought out John Person's share of the company. John retired from funeral service effective June 1st of that year. Shortly after, the Jackan's brought their son Ted and son-in-law Jake into the company.